The University of Missouri Sinclair School of Nursing today announced they have received nearly $20 million in funding from the U.S. Department of Health and Human Services Centers for Medicare &Medicaid Services (CMS) to expand their Missouri Quality Initiative for Nursing Homes. Through this program the Sinclair School of Nursing is working to create a national model for senior care and significantly reduce national health care spending. Launched in 2012, the Missouri Quality Initiative for Nursing Homes is a partnership among MU, CMS and state Medicaid programs, and 16 collaborating nursing homes in St. Louis committed to improving care. 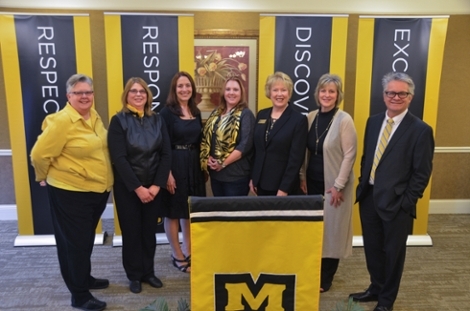 The program is led by Marilyn Rantz, Curators’ Professor Emerita of Nursing and a team of MU researchers. The second phase of the program will take place at an additional 16 homes that have systems in place to manage the most common diseases associated with hospitalizations: pneumonia, dehydration, congestive heart failure, urinary tract infections, skin ulcers and asthma. Potentially eligible homes have already been identified by CMS and will be contacted shortly by the MOQI team. Rantz’s pioneering work in nursing homes care quality spans thirty years and she is regarded as a premier international expert in quality measurement in nursing homes and research programs to improve quality of care of older people. Other MU nursing school researchers involved in the project include: Greg Alexander, professor Marcia Flesner, clinical instructor Jessica Mueller, program coordinator Lori Popejoy, associate professor Amy Vogelsmeier, associate professor MU researchers from other colleges and schools include: Colleen Galambos, professor in the College of Human Environmental Sciences’ School of Social Work Greg Petroski, biostatistician in the Medical Research Office.